Silica xerogel is usually commercialized as coarse granules or beads, a few millimeters in diameter. Some grains may contain small amounts of indicator substance that changes color when they have absorbed some water. Small paper envelopes containing silica xerogel pellets, usually with a "do not eat" warning, are often included in dry food packages to absorb any humidity that might cause spoilage of the food. Silica gel was in existence as early as the 1640s as a scientific curiosity. It was used in World War I for the adsorption of vapors and gases in gas mask canisters. The synthetic route for producing silica gel was patented by chemistry professor Walter A. Patrick at Johns Hopkins University in 1918. In World War II, silica gel was indispensable in the war effort for keeping penicillin dry, protecting military equipment from moisture damage, as a fluid cracking catalyst for the production of high octane gasoline, and as a catalyst support for the manufacture of butadiene from ethanol (feedstock for synthetic rubber production). Type A – clear pellets, approximate pore diameter: 2.5 nm, drying and moistureproof properties, can be used as catalyst carriers, adsorbents, separators and variable-pressure adsorbent. Type B – translucent white pellets, pore diameter: 4.5⁠–⁠7.0 nm, liquid adsorbents, drier and perfume carriers, also may be used as catalyst carriers, cat litter. Type C – translucent, micro-pored structure, raw material for preparation of silica gel cat litter. Additionally dried and screened, it forms macro-pored silica gel which is used as drier, adsorbent and catalyst carrier. Silica alumina gel - light yellow, chemically stable, flame-resistant, insoluble except in alkali or hydrofluoric acid. Superficial polarity, thermal stability, performance greater than fine-pored silica gel. Stabilizing silica gel - non-crystalline micro-porous solid powder, nontoxic, flame-resisting, used in brewery of grains for beer to improve taste, clearness, color and foam, removal of non-micro-organism impurities. Silica gel's high specific surface area (around 800 m2/g) allows it to adsorb water readily, making it useful as a desiccant (drying agent). Silica gel is often described as "absorbing" moisture, which may be appropriate when the gel's microscopic structure is ignored, as in silica gel packs or other products. However, material silica gel removes moisture by adsorption onto the surface of its numerous pores rather than by absorption into the bulk of the gel. Once saturated with water, the gel can be regenerated by heating it to 120 °C (250 °F) for 1–2 hours. Some types of silica gel will "pop" when exposed to enough water. This is caused by breakage of the silica spheres when contacting the water. In many items, moisture encourages the growth of mold and spoilage. Condensation may also damage other items like electronics and may speed the decomposition of chemicals, such as those in vitamin pills. Through the inclusion of silica gel packets, these items can be preserved longer. Silica gel may also be used to keep the relative humidity (RH) inside a high frequency radio or satellite transmission system waveguide as low as possible (see also Humidity buffering). Excessive moisture buildup within a waveguide can cause arcing inside the waveguide itself, damaging the power amplifier feeding it. Also, the beads of water that form and condense inside the waveguide change the characteristic impedance and frequency, degrading the signal. It is common for a small compressed air system (similar to a small home aquarium pump) to be employed to circulate the air inside the waveguide over a jar of silica gel. Silica gel is also used to dry the air in industrial compressed air systems. Air from the compressor discharge flows through a bed of silica gel beads. The silica gel adsorbs moisture from the air, preventing damage at the point of use of the compressed air due to condensation or moisture. The same system is used to dry the compressed air on railway locomotives, where condensation and ice in the brake air pipes can lead to brake failure. Silica gel is sometimes used as a preservation tool to control relative humidity in museum and library exhibitions and storage. Other applications include diagnostic test strips, inhalation devices, syringes, drug test kits and hospital sanitation kits. In chemistry, silica gel is used in chromatography as a stationary phase. In column chromatography, the stationary phase is most often composed of silica gel particles of 40–63 μm. Different particle sizes are used for different kinds of column chromatography as the particle size is related to surface area. The differences in particle size dictate if the silica gel should be used for flash or gravity chromatography. In this application, due to silica gel's polarity, non-polar components tend to elute before more polar ones, hence the name normal phase chromatography. However, when hydrophobic groups (such as C18 groups) are attached to the silica gel then polar components elute first and the method is referred to as reverse phase chromatography. Silica gel is also applied to aluminium, glass, or plastic sheets for thin layer chromatography. The hydroxy (OH) groups on the surface of silica can be functionalized to afford specialty silica gels that exhibit unique stationary phase parameters. These so-called functionalized silica gels are also used in organic synthesis and purification as insoluble reagents and scavengers. Silica gel is not expected to biodegrade in either water or soil. Silica gel is also used as cat litter, by itself or in combination with more traditional materials, such as clays including bentonite. It is non-tracking and virtually odorless. Silica gel, also referred to as silica aerogel or hydrated silica, is listed by the FDA in the United States as generally recognized as safe (GRAS), meaning it can be added to food products without needing approval. Silica is allowed to be added to food in the US at up to 2% as permitted under 21 CFR 172.480. In the EU it can be in up to 5% concentrations. Listed uses include: anticaking agent, defoaming agent, stabilizer, adsorbent, carrier, conditioning agent, chillproofing agent, filter aid, emulsifying agent, viscosity control agent, and anti-settling agent. Given the water adsorption properties of silica gel, it is used in domestic water filters. The surface structure of silica gel allows the adsorption of some minerals which are dissolved in the water, or "Ion-exchange" as it is marketed. Due to the lack of regulations for domestic water filtration products, no studies validate the manufacturer claims regarding the effectiveness of the filtration system. Silica gel may be doped with a moisture indicator that gradually changes its color when it transitions from the anhydrous (dry) state, to the hydrated (wet) state. Common indicators are cobalt(II) chloride and methyl violet. Cobalt (II) chloride is deep blue when dry and pink when wet, but it is toxic and carcinogenic, and was reclassified by the European Union in July 2000 as a toxic material. Methyl violet can be formulated to change from orange to green, or orange to colorless. It is also toxic and potentially carcinogenic, but is safe enough to have medicinal uses. 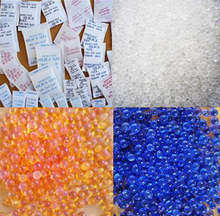 Silica gel is non-toxic, non-flammable, and non-reactive and stable with ordinary usage. It will react with hydrogen fluoride, fluorine, oxygen difluoride, chlorine trifluoride, strong acids, strong bases, and oxidizers. Silica gel is irritating to the respiratory tract and may cause irritation of the digestive tract, and dust from the beads may cause irritation to the skin and eyes, so precautions should be taken. Crystalline silica dust can cause silicosis, but synthetic amorphous silica gel is indurated so does not cause silicosis. Additional hazards may occur when doped with a humidity indicator. ^ Maryann Feldman and Pierre Desrochers (March 2003). "Research Universities and Local Economic Development: Lessons from the History of the Johns Hopkins University" (PDF). Industry and Innovation. 10 (1): 5–24. Archived from the original (PDF) on 2005-11-12. ^ a b Environmental Health and Safety (2007-09-10). 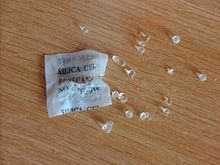 "Silica Gel". Retrieved 2008-01-12. ^ Andrew Kantor (2004-12-10). "Non-Tech High Tech Litters the Landscape". USA Today. Retrieved 2008-03-02. ^ "Notification of the GRAS Determination of Silicon Dioxide When Added Directly or Indirectly to Human Food" (PDF). Archived from the original (PDF) on April 18, 2013. ^ "GRAS Notice (GRN) No. 298" (PDF). Archived from the original (PDF) on April 9, 2011. ^ J. B. Peri , A. L. Hensley Jr. (1968). "The surface structure of silica gel". The Journal of Physical Chemistry. 72 (8): 2926–2933. doi:10.1021/j100854a041. ^ "Methyl Violet Safety Data Sheet" (PDF). labchem. ^ Fisher Scientific (1997-02-09). ""Silica Gel Dessiccant"[sic]". Retrieved 2008-01-12.